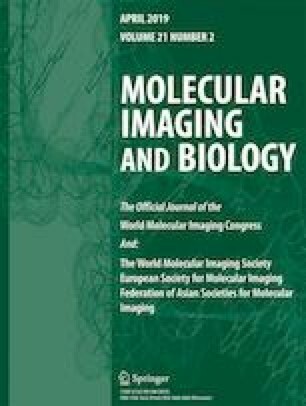 The aim of this study was to evaluate positron emission tomography (PET) imaging with [68Ga]NODAGA-c(RGDfK) ([68Ga]RGD), in comparison with 2-deoxy-2-[18F]fluoro-D-glucose ([18F]FDG), for early monitoring of the efficacy of an antiangiogenic agent associated or not with chemotherapy, in a mouse model of glioblastoma (GB). Mice bearing U87MG human GB cells line were parted into five groups of five mice each. One group was imaged at baseline before the treatment phase; another group was treated with bevacizumab (BVZ), another group with temozolomide (TMZ), another group with both agents, and the last one was the control group. Tumors growth and biological properties were evaluated by caliper measurements and PET imaging at three time points (baseline, during treatment t1 = 4–6 days and t2 = 10–12 days). At the end of the study, tumors were counted and analyzed by immunohistochemistry (CD31 to evaluate microvessel density). The tumor volume assessed by caliper measurements was significantly greater at t1 in the control group than in the TMZ + BVZ-treated group or in the BVZ-treated group. At t2, tumor volume of all treated groups was significantly smaller than that of the control group. [18F]FDG PET failed to reflect this efficacy of treatment. In contrast, at t1, the [68Ga]RGD tumor uptake was concordant with tumor growth in controls and in treated groups. At t2, a significant increase in tumor uptake of [68Ga]RGD vs. t1 was only observed in the TMZ-treated group, reflecting a lack of angiogenesis inhibition, whereas TMZ + BVZ resulted in a dramatic tumor arrest, reduction in microvessel density and stable tumor [68Ga]RGD uptake. [68Ga]RGD is a useful PET agent for in vivo angiogenesis imaging and can be useful for monitoring antiangiogenic treatment associated or not with chemotherapy. The study was supported by the French Association Nationale de la Recherche et de la Technologie (ANRT) and PETNET Solutions SAS, Siemens healthineers.